Your organization's biggest asset is your people. People bring economic value to your company. Their knowledge, resourcefulness, and creativity translate directly into earnings—if they're being utilized. When you invest in developing people and helping them discover, develop, and achieve their real potential, everyone benefits! Have you ever tried training to help you achieve results? Most “training programs” are like a black hole. You keep pouring more and more money into them, but you never see any results. We work with your Executive Team so they are able to build collaborative teams that focus on getting bottom line results. Are your executives driving your vision to your front line? 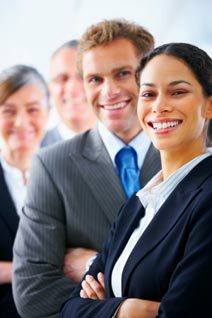 We can help you mold a Management Team that creates the environment where employees are motivated to meet organizational goals. What is your organization’s Employees Loyalty Score? Your organization will develop a culture where continuous improvement, higher levels of achievement, standards of excellence, and exceeding customer expectations prevail. The results are immediate and life changing. 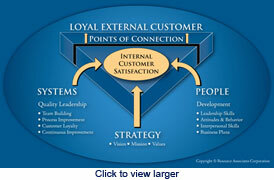 Looking to build and maintain a loyal customer base to gain the competitive edge? We are certified by Total Quality Institute, an international network of skilled professionals who provide a comprehensive, customized, and results-oriented approach to continuous improvement planning and implementation. Recently sustainability has become a business concept and strategy of great significance. Nordlinger Consulting Group works with organizations like yours to assist them in gaining short-term results and a long-term competitive advantage. How we do this depends upon the organization’s uniqueness, but in general, it involves aligning their people and processes with their strategy. It is our experience that sustainability is greatly misunderstood and often misused. Many simply view it as a “green” initiative. That is part of it, but it is much more. When done correctly and for the right reasons, it will not only make your organization stronger, but will also improve your bottom line while helping the environment. Innovation, employee loyalty, stakeholder loyalty, improved effectiveness and efficiency, and a stronger bottom line are some of the documented and proven results from a successful implementation. It has been proven that sustainable practices in business lead to profitability, growth, and success. How much waste does your organization create? How much of that waste could be reduced, re-used, or recycled? How much could reducing your waste save your company? Sustainability can give your organization a competitive business advantage while positively impacting the Environment. What does sustainability mean to your business? Contact us to find out how your organization can increase its profits, and improve its people, while helping to save the environment. Good coaches have a knack for helping people become more of their authentic selves. They have a way of encouraging people to dig deep and realize more of their full potential than even they, themselves, thought possible. A qualified coach can help you achieve more of your business and personal potential. That's what we're all about—helping people at all levels achieve their true potential. Personal coaching is the single best way to accelerate your own progress and realize your personal, professional, and other life goals. It's an active and engaging process that will stimulate success in all areas of your life. 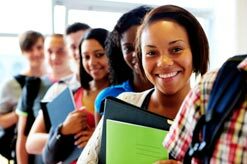 The Rising Stars Process is designed to help today's youth develop their personal leadership skills and begin to set goals and directions for their lives beginning at an earlier age. Leadership is essential in enabling youth to develop character, confidence, and values that promote the understanding of healthy behavior. Rising Stars is an innovative and unique inside-out self-development process. This research-based approach focuses on three critical elements that promote personal leadership, healthy behaviors, and the skills employers identify as essential. These elements are developed, applied, and reinforced throughout the process and through a follow-up process to strengthen and perpetuate successful behaviors.